Golden Earring. The Belgian hard-men of Rock ‘n’ Roll. The Belgian racing season is just about to kick off this weekend with two semi-classics: Omloop Het Niuewsblad on Saturday and Sunday’s Kuurne-Bruxelles-Kuurne. As the young kids in Norcal say, awesome sauce. We decided to celebrate this auspicious occasion with some Dutch treats for the rest of the week. First off, a musical tribute from the most famous Dutch rock ‘n’ roll outfit there is. 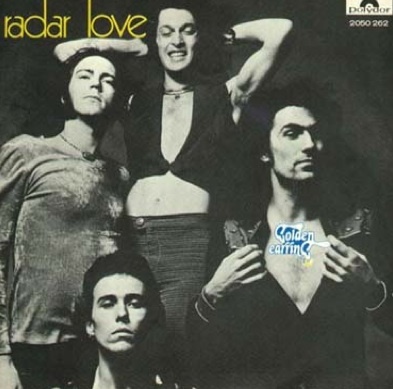 Golden Earring, baby, and their legendary, one-bass-note-thumping, monster hit, Radar Love. Golden Earring was founded in 1961, the year Belgian Rick Van Looy won Paris-Roubaix, and they’re still rockin.’ That’s the kind of raw staying power and attitude you need to win on the cobblestones. The GE boys just celebrated their 49th anniversary — how is that possible? Because George Kooymans and his neighbor, Rinus Gerritsen started this thing at ages 13 and 15. And it’s the same four original guys, no line-up changes! Rock on, Dutch dudes. Fascinating tidbit: the band was originally named The Tornados — yes, just like Belgian superstar and King of the Cobbles, Tornado Tom Boonen. A quick look at their song titles and it’s clear these guys know what it takes to win a bike race on the stones in miserable Belgian weather. The Devil Made Me Do It, Something Heavy Going Down, My Killer, My Shadow, Temporary Madness, This Wheel’s on Fire and Another 45 Miles. Sounds like the dramatic soundtrack music to a long, hard, ball-busting, leg-breaking day in the saddle. But if you’re Golden Earring, those kinds of brutal sacrifice are worth it. You’ve shared the stage with the Kinks, Zeppelin, Hendrix, Kiss and Aerosmith. So you tell me right now Golden Earring don’t know who’s winning Omloop Het Niuewsblad and Kuurne-Bruxelles-Kuurne. “It’s my baby calling, says I need you here, And it’s half past four and I’m shifting gear.” Pump the tires, oil the drive-train and blast Radar Love. It’s almost Belgian time. In fact, why not invite GE to join Phil Liggett for the TV coverage? « Gert Steegman’s “headache.” To race or not to race post-concussion.